Editor’s Note: This article accompanies Understanding Wi-Fi's two spectrum bands, posted elsewhere on Macworld.com. You can check to see at what speed a given device has connected to an Apple base station via AirPort Utility. Launch the program (from /Applications/Utilities) and connect to your base station. Click on Manual Setup, then click on the Advanced icon. At the bottom of the panel, click on the Logs & Statistics button. The Wireless Clients tab shows what devices are connected, the protocol they use, and, most importantly, the real speed they’ve negotiated with the base station. The Wireless Clients tab shows what devices are connected, displaying their MAC (Media Access Control) adapter address, the signal and noise levels, and, most importantly, the data rate. The data rate is the current raw speed at which an adapter is connected, which is 54 (Mbps) for 802.11g, 130 (Mbps) for 802.11n in 2.4 GHz, and 270 (Mbps) for 802.11n in 5 GHz with wide channels. The Type column shows what protocol is in use. If it shows 802.11b/g, then g is used; b/g/n, then n is in use in 2.4 GHz; if a/n, then n in 5 GHz. 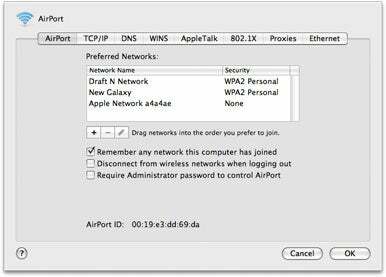 Use the Network preference pane to find the MAC address of an AirPort adapter to identify it in AirPort Utility. To better understand what devices you’re looking at, click the DHCP Clients tab (assuming you’re sharing a network connection’s IP address via the base station). The Client ID column in that tab will show you the Bonjour name or client ID of that device. 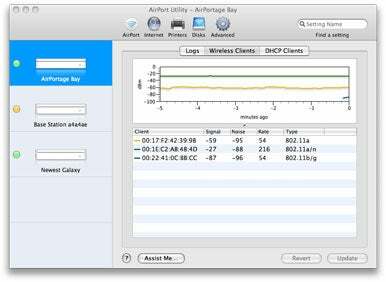 You can use this data to help place a base station, too, watching the speed of the connection rise or fall as you check AirPort Utility while you put a laptop in different places in relation to the base station.